One of the interesting things about the fermenting craft beverage scene in the Capital Region the collaborations that happen between the different players. 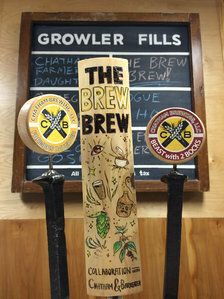 The Brew Brew will be a rotating line on the shop's growler menu that will feature various combinations of Chatham Brewing beers with the Brew Blend, a private label coffee created specifically for Brew by Barkeater Coffee Roasters. The first batch (The Brew Brew: Batch 1) will be a Coffee Maple Amber Ale. More concoctions are in the works and will be announced as they are released. The shop hopes to rotate this offering every 2-3 months with different brews each time. The launch of the first Brew Brew is set for a tasting during 1st Friday on May 6 (also Tulip Fest weekend) from 5-8 pm. Death Wish/Albany Distilling: It sounds like another local beverage collaboration -- a coffee-flavored vodka from Death Wish Coffee and Albany Distilling Co. -- will also be released soon.